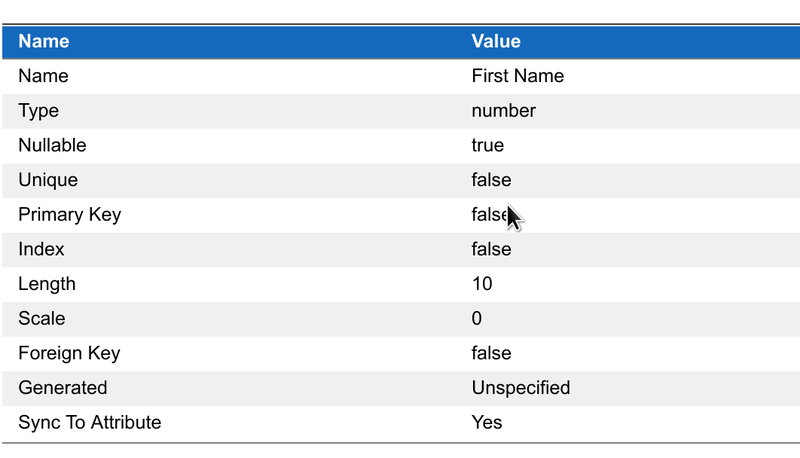 I am interested if there is way to extend the schema to support easily custom metadata on entities and/or attributes (columns), so they can be later exported into XML and processed and also will be included in published documentation. Generic ontology tools give you much bigger range in form of what you can do, maybe you should try to adopt this for later times and new design of VP. General Context - person, address, etc. Specific Master Data Context - Product, etc. So I have something like 4 labels which I would like to bind on entities for later usage. Or is there only way by writing my own VP plugin? You can use Tagged Value as custom properties. For your case, I suggest using Stereotype. You can see below page for more details. but in most of cases, Tagged Value already included by default. Does tagged values supports ER diagrams? No, just classes are supported. Step-by-Step learning guide that shows you what model element specification is and how you can edit element properties through the window. @roykeung - is tagged value supported on attribute level as well. See during our analysis, I would like to mark some field as SENSITIVE or other classification, I know I can use documentation, but some Key/Value store is better for such purpose. 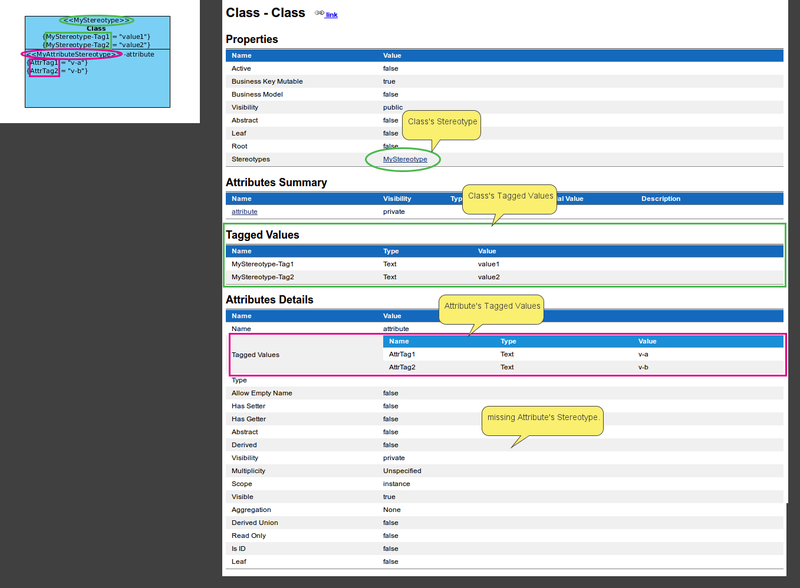 Most of the model elements in Visual Paradigm can be configured to use stereotypes together with tagged values, class members like attribute and operation support them too. The link Roy posted above shows you how to apply them to actor, but it is no different for attribute. Here shows how I defined a custom stereotype for attribute called “MyStereotype” with one boolean tagged value “Sensitive” default to false. By selecting from the diagram’s popup menu item “Presentation Options” > “Show Tagged Values” > “Show All”, you see I could make the tagged values visible in the diagram as well. Is it possible to customize Publisher ? I didn’t find much documentation on this. I already esteablished automated publishing to web server with VP, so its really nice feature after every commit I have fresh view for public users. Thanks for any hints and helpful thoughts. but the attribute’s Stereotype is missing. We will fix to show the attribute’s stereotype. PS: My testing result is different to your description. If I misunderstand your problem, may you describe more details? Thanks. @peter.wong - ok, so this is behavior on Class, but ER Entity has even different behavior from Class, I think only Stereotype on Entity is visible, the rest is not. It will be valuable to display these as well on Entity layer. @peter.wong - I checked the ER diagram entity. I am just trying to mark attribute as Sensitive, so it is visible in documentation as well. So it is possibly bug? Otherwise Stereotype and tagged values are shown on Entity level, but attribute is missing completely for both stereotype and tagged values. Thanks for your information. We will fix it soon. FYI. the Attribute’s Stereotypes are fixed and ready in latest patch. The fix has been fixed and is ready in latest patch build. thx for info, will test.